If you’ve done research in a place where a disaster has struck, then you know the difficulty I experienced trying to find my Great Great Grandparent’s marriage record. The 1906 San Francisco earthquake and fire not only wiped out many government records, but church records as well. The ability to use one or the other to identify a marriage is almost non-existent prior to 1906. This is where newspapers come in. As more and more newspapers are being digitized, indexed, and put on the internet, researching them is getting much easier all the time. 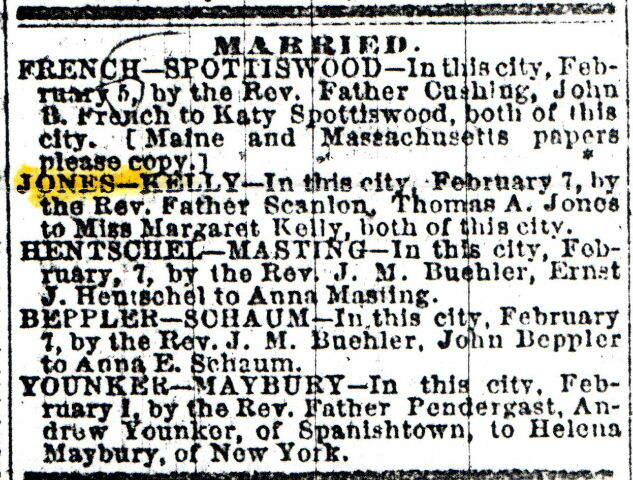 It turned to newspapers when I realized that there was probably no official record of my Great Great Grandparent’s marriage. The date fit with information I had found in the census and city directories. It gives me the date that they married, 7 Feb 1869 (a Saturday). It even tells me who they were married by, Father Scanlon. I’m not entirely sure but Father Scanlon probably was stationed at St. Patrick’s church in San Francisco. It may not be a marriage certificate, but given the time period, this is probably all I would learn from it anyway. They were incredibly skimpy on details in early California. It’s satisfying to have tracked down this proof that they married. Of course, I had plenty of documentation and family stories that said they were married. But it’s nice to know that they really did!